1788: born in Kyôto. He is the third son of the Edo star Sawamura Sôjûrô III and his mother is the sister of the Kamigata star Arashi Hinasuke I. 1st lunar month of 1793: he makes his first appearance on stage, at the Nakamuraza, where he receives the name of Sawamura Tetsunosuke I a plays a little role in the drama "Saikai Soga Nakamura". 3rd lunar month of 1801: his father Sawamura Sôjûrô III dies; Tetsunosuke goes back to his native Kamigata. 11th lunar month of 1801: Sawamura Tetsunosuke I takes the name of Sawamura Tanosuke II in Kyôto at the Kitagawa no Shibai, playing in the drama "Furuki Omotte Aratama no Kaomise". 1802 ~ 1806: He spends most of his early years performing in Kamigata koshibai. 4th ~ 6th lunar months of 1806: tour in Nagoya for a troupe led by Arashi Kichisaburô II, Yoshizawa Iroha I, Arashi Sangorô III, Tanosuke and Nakayama Bungorô I; they perform at the Tachibana no Shibai in dramas like "Keisei Sakura no Shima", "Gion Sairei Shinkôki", "Hirakana Seisuiki", "Sarumawashi Kadode no Hitofushi" or "Komochi Yamanba". 7th lunar month of 1806: Tanosuke achieves a great success in Ôsaka at the Kita-Horie Ichi-no-Gawa Shibai, playing the roles of Princess Toki and the koshimoto Sumie in the drama "Ômi Genji Senjin Yakata", which is produced by Arashi Gonnosuke. 3rd lunar month of 1808: "Hachijin Shugo no Honjô" is adapted for Kabuki for the first time, in Kyôto at the Kitagawa no Shibai; Tanosuke plays the role of Hinaginu [casting]. Fall 1808: Tanosuke goes to Edo. 11th lunar month of 1808: Tanosuke plays at the Ichimuraza in the drama "Irosoyuru Nidai Genji", which celebrates the shûmei of Nakamura Rikô II. 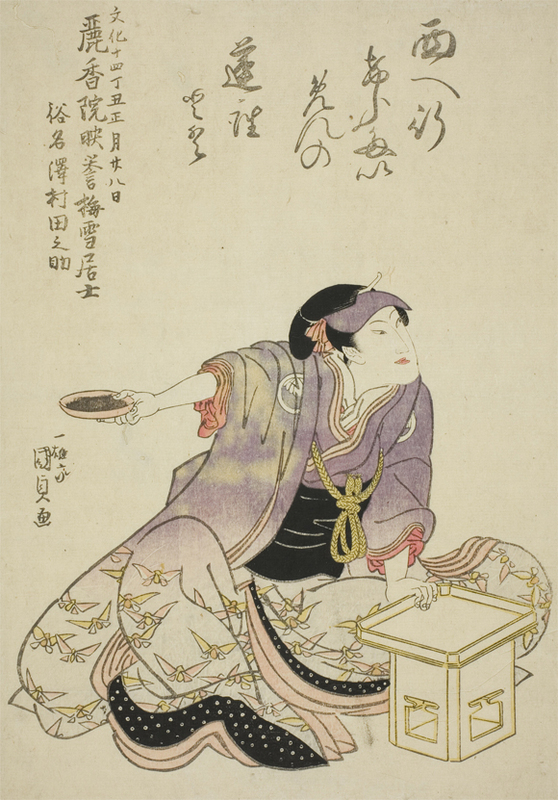 1st lunar month of 1810: premiere at the Ichimuraza of Tsuruya Nanboku IV and Sakurada Jisuke II drama "Kokoro no Nazo Toketa Iroito"; Tanosuke plays the role of the courtesan Koito [casting]. 9th lunar month of 1813: Tanosuke plays at the Nakamuraza the role of Kuzu-no-Ha in the drama "Ashiya Dôman Ôuchi Kagami". Fall 1813: Tanosuke goes back to Kamigata. 11th lunar month of 1813: Tanosuke plays in Kyôto at the Minamigawa no Shibai in the drama "Ono no Tôfû Aoyagi Suzuri". He also performs all the roles of a 7-role hengemono "Sawamurasaki Hatsunanatan". He finally plays the role of Yûshide in the drama "Karukaya Dôshin Tsukushi no Iezuto"; the role of Tatara Shindô Saemon is played by Asao Kuzaemon I. 1st lunar month of 1814: Tanosuke plays the roles of Miyuki and Princess Harusame in the drama "Keisei Tsukushi no Tsumagoto", which is staged in Ôsaka at the Kado no Shibai. This is the first performance in Kabuki history of a play based on the "Asagao Nikki" world [casting]. Fall 1815: Tanosuke goes back to Edo. 11th lunar month of 1815: Tanosuke plays at the Nakamuraza in Fukumori Kyûsuke I's kaomise drama "Shitennô Oedo no Kaburaya", which celebrates the shûmei of Onoe Kikugorô III and Kataoka Gachô. His yearly salary is 900 ryô. 11th lunar month of 1816: Tanosuke appears on stage for the last time, at the Nakamuraza, playing in the drama "Fuwa Nagoya Yuki no Tategasa". 1st lunar month of 1817: Tanosuke's posthumous rank in the Edo hyôbanki, wakaonnagata section, is jô-jô-kichi (superior - superior - excellent). Sawamura Tanosuke II was a talented onnagata actor, endowed with delicate features and a beautiful voice, who achieved fame for himself in both Edo and Kamigata. He was able to play any role, excelling in keisei roles, but unfortunately died too young.